How can this cat possibly get any better? With its flexible, powerful approach and superb sound, Dynamics 4 could easily become your go-to dynamics plugin. Integrated external side chain. Excellent metering. Smooth transition between Peak/RMS. We'd like to see output filters Over-flattering output makeup gain. Like its three predecessors, Blue Cat's Dynamics 4 plugin (VST/AU/AAX/RTAS/DX) is a flexible dynamics device capable of delivering compression, limiting, expansion, gating and waveshaping. With its dual threshold curves, it can compress and expand at the same time - although since the two share attack and release settings, this is less useful than it may seem. The detection character is continuously variable between smooth opto and fast VCA styles, and the detection mode morphs smoothly between transient peak and RMS average loudness. As well as the expected Attack and Release controls, the Peak Envelope panel parameters also include Hold, setting the time after which the release curve activates; and an additional Shape parameter for the attack and hold curves. RMS mode, meanwhile, has a time envelope determining the window within which the average signal level is taken. The sidechain features high- and low-pass filters to adjust frequency sensitivity, as does the main input, although we're surprised there are no filters on the output, too, for controlling harmonics generated by the waveshaper. Complementing the new external sidechain, there are two modes of stereo operation: left/ right and mid/side. Each mode offers several options for linking the left and right signals in the sidechain: Average, Min, Max, Flip, Use Left and Use Right. Oversampling (x2 and x4) helps to reduce aliasing, particularly with fast attack times, at the cost of CPU. A brickwall limiter on the output is a useful addition for protecting ears and speaker drivers, and the Dry/Wet knob enables parallel processing. The metering is flexible, with several zoom levels into the gain reduction meter, which also has a histogram view; while the timelined envelope view shows the gain reduction in relation to the incoming waveform. Separate input and output meters complete the picture. Although Dynamics 4 can work as a polite leveller if you want it to, it's really anything but that. It coughs, spits and grunts, and can get interestinglylaity. This aggressive impression is helped and perhaps flattered by the over- zealous automatic gain compensation, which brings the loudness up way beyond where a manual adjustment by ear would take it - so much so, in fact, that flicking in the output hard limiter is well-advised, especially if you move into waveshaping experiments with peak, VCA and fast envelope settings, when the distortion harmonics can get positively rude. For an easier ride, moving the sensing towards the RMS and opto styles calms things down somewhat. The lower of the two threshold curves is a great addition, not just for orthodox gating but also upwards compression - bringing up the ghost notes of a snare drum, for example. 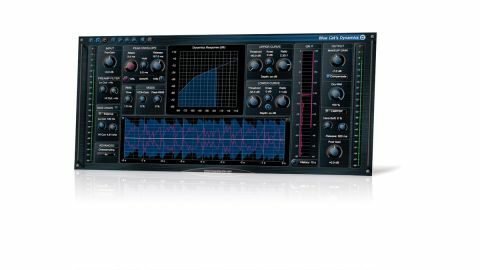 Dynamics 4 may not be in any way revolutionary, but Blue Cat isn't far off in claiming that it's the most versatile dynamics processor around. More than the sum of its parts, it's a detailed and precise device that's the dynamic equivalent of a surgical EQ. To match this potential power, though, you do need a solid understanding of dynamics control and a good ear to get the best out of it, but if you qualify on both those counts, this is pretty much a must-have.